You’ll notice the iCloud interface is very iOS-like and all the animations and buttons feel like iOS, pretty impressive for the web wouldn’t you say? This little tip comes from @devongovett via @viticci on Twitter, you can follow us there too. Update: To clarify, most things don’t work without a beta login, and each time you click on something you will get an error message like the one below that requires you to reload the springboard again. you just have to be a developer, not a paid developer. Are you sure? I can’t get my free dev account to work, I didn’t renew this year. 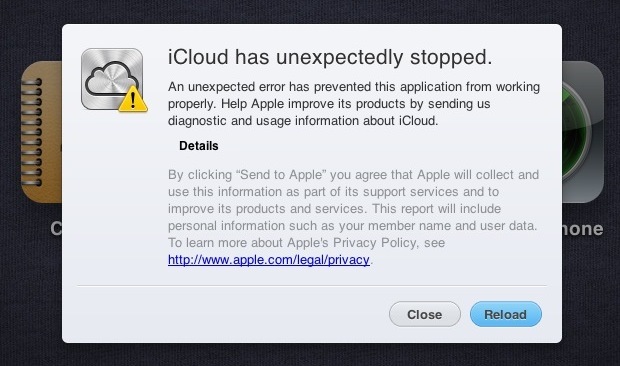 I am a paid developer and am unable to access iCloud. I can’t even do this cheat because when I right click, I don’t see the option to “inspect elements”. Advice appreciated. Only limited developers’ accounts are open to beta test. I was able to login last night but no more since this morning. Apparently they tighten up the access privilege. I am curious to hear what the benefits and improvements are to I cloud. As a long-time user of both drop box and mobile me I am anxiously awaiting I cloud and a clear explanation of how it will benefit users.